The high in Birmingham for February 22nd, 2019 was 60F. The low was 53F. The high in Birmingham for February 21st, 2019 was 62F. The low was 53F. The high in Birmingham for February 20th, 2019 was 61F. The low was 47F. The high in Birmingham for February 19th, 2019 was 47F. The low was 40F. The high in Birmingham for February 18th, 2019 was 53F. The low was 41F. The high in Birmingham for February 17th, 2019 was 65F. The low was 48F. 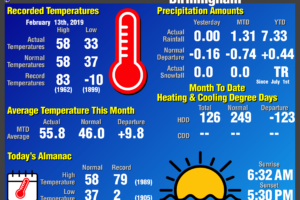 The high in Birmingham for February 16th, 2019 was 63F. The low was 46F. The high in Birmingham for February 15th, 2019 was 64F. The low was 56F. The high in Birmingham for February 14th, 2019 was 61F. The low was 37F. The high in Birmingham for February 13th, 2019 was 58F. The low was 33F. The high in Birmingham for February 11th, 2019 was 63F. The low was 51F. The high in Birmingham for February 10th, 2019 was 54F. The low was 45F. The high in Birmingham for February 9th, 2019 was 53F. The low was 34F.